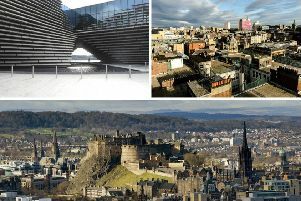 Now a map of Scotland’s best rated tourist attractions by county has been revealed. Researchers used TripAdvisor to search for things to do in each area, before noting the attraction with the highest number of favourable reviews. While there’s little surprise that Kelvingrove Museum is number one in Glasgow, residents in the capital may be surprised to find Arthur’s Seat claiming top spot ahead of Edinburgh Castle. In East Dunbartonshire, The Kirky Puffer bar in Kirkintilloch is rated the top local attraction, while Eden Mill in Fife has attracted more favourable reviews than Dunfermline Abbey or St Andrew’s Castle. The map was produced for FamilyBreakFinder.co.uk.